Today is 2018's World Digital Preservation Day. It might appear that this post has little to do with digital preservation. However, I hope that the long post below the fold is the start of a series asking the simple question underlying not just digital preservation, but many areas of the digital world, "how do I know this digital content is real?" It is another of the many problems for which blockchain is touted as a solution by people lacking real-world understanding of either the problem or the technology, or both. In this post I'm going to look in some detail at Certificate Transparency, an important initiative aimed at improving security and authenticity on the Web, and relate the techniques it uses to those underlying the LOCKSS system. In the next post I plan to ask how these techniques could be applied to other areas in which authenticity is important, such as in the software supply chain. My current Firefox browser trusts 305 root certificates from 79 unique organizations. One of these organizations is the Internet Security Research Group, a not-for-profit organization hosted by the Linux Foundation and sponsored by many organizations including Mozilla and the EFF, which has greatly improved the information hygiene of the Web through a program called Let's Encrypt. This has provided over 115 million Web sites with free certificates carrying a signature chain rooted in a certificate that almost all browsers trust. 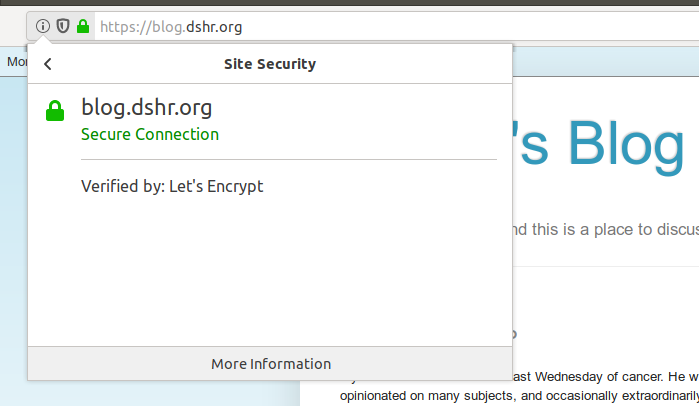 This blog's certificate is one of them, as you can see by clicking on the padlock icon. 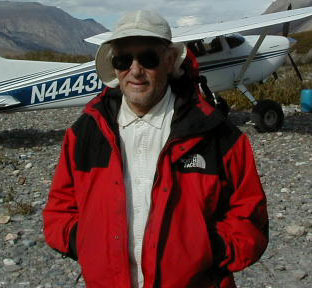 Barysevich identified four such sellers of counterfeit certificates since 2011. Two of them remain in business today. The sellers offered a variety of options. In 2014, one provider calling himself C@T advertised certificates that used a Microsoft technology known as Authenticode for signing executable files and programming scripts that can install software. 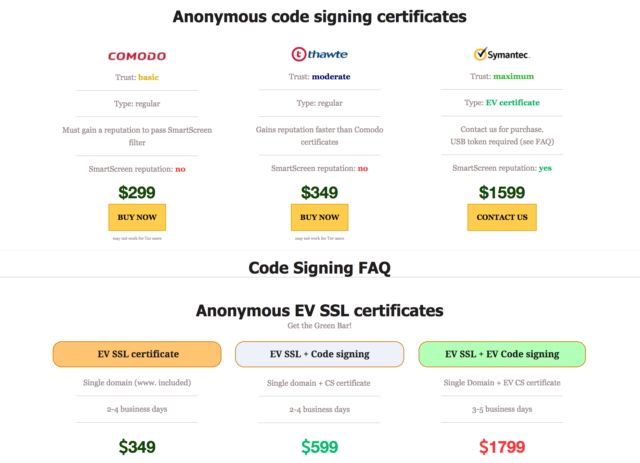 C@T offered code-signing certificates for macOS apps as well. ... "In his advertisement, C@T explained that the certificates are registered under legitimate corporations and issued by Comodo, Thawte, and Symantec—the largest and most respected issuers,"
Over the past few years there have been numerous instances of misissued certificates being used to spoof legitimate sites, and, in some case, install malicious software or spy on unsuspecting users. More recently, a large U.S.-based CA (TrustWave) admitted that it issued subordinate root certificates to one of its customers so the customer could monitor traffic on their internal network. Subordinate root certificates can be used to create SSL certificates for nearly any domain on the Internet. Although Trustwave has revoked the certificate and stated that it will no longer issue subordinate root certificates to customers, it illustrates just how easy it is for CAs to make missteps and just how severe the consequences of those missteps might be. Domain Validated (DV) certificates verify control over the DNS entries, email and Web content of the specified domain. They can be issued via automated processes, as with Let's Encrypt. Organization Validated (OV) certificates are supposed to verify the legal entity behind the DV-level control of the domain, but in practice are treated the same as DV certificates. 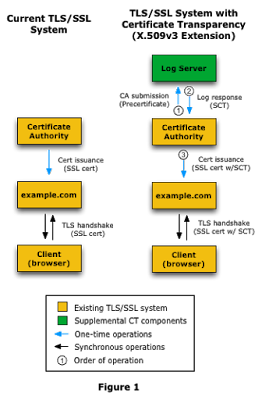 Extended Validation (EV) certificates require "verification of the requesting entity's identity by a certificate authority (CA)". Verification is supposed to be an intrusive, human process. Google's investigation revealed that over a span of years, Symantec CAs have improperly issued more than 30,000 certificates. Such mis-issued certificates represent a potentially critical threat to virtually the entire Internet population because they make it possible for the holders to cryptographically impersonate the affected sites and monitor communications sent to and from the legitimate servers. They are a major violation of the so-called baseline requirements that major browser makers impose of CAs as a condition of being trusted by major browsers. Symantec's repeated violations underscore one of the problems Google and others have in enforcing terms of the baseline requirements. When violations are carried out by issuers with a big enough market share they're considered too big to fail. If Google were to nullify all of the Symantec-issued certificates overnight, it might cause widespread outages. This is the basic idea that underlay the early efforts. Except for rare cases, such as a certificate being replaced after compromise or expiration, every time a service is accessed the client should receive the same certificate. Clients can consult a service that collects the (hash of) certificates as they are received at locations all over the Internet to detect the use of fraudulent certificates. Five years ago in Trust in Computer Systems I reviewed the state of the art in implementing this concept, including Moxie Marlinspike's 2011 Convergence, a distributed approach, and the EFF's SSL Observatory, a centralized approach. Note that both approaches are implemented without participation by certificate authorities or owners, and neither has achieved widespread adoption. more effective than client-only approaches, which can detect that a certificate has changed but not whether the change was authorized. In order to improve the security of Extended Validation (EV) certificates, Google Chrome requires Certificate Transparency (CT) compliance for all EV certificates issued after 1 Jan 2015. One of the problems is that there is currently no easy or effective way to audit or monitor SSL certificates in real time, so when these missteps happen (malicious or otherwise), the suspect certificates aren’t usually detected and revoked for weeks or even months. Logs, to which CAs report their current certificates, and from which they obtain attestations, called Signed Certificate Timestamps (SCTs) that owners can attach to their certificates. Clients can verify the signature on the SCT, then verify that the hash it contains matches the certificate. If it does, the certificate was the one that the CA reported to the log, and the owner validated. It is envisaged that there will be tens but not thousands of logs; Chrome currently trusts 26 logs. Each log maintains a Merkle tree data structure of the certificates for which it has issued SCTs. Monitors, which periodically download all newly added entries from the logs that they monitor, verify that they have in fact been added to the log, and perform a series of validity checks on them. They also thus act as backups for the logs they monitor. Auditors, which use the Merkle tree of the logs they audit to verify that certificates have been correctly appended to the log, and that no retroactive insertions, deletions or modifications of the certificates in the log have taken place. Clients can use auditors to determine whether a certificate appears in a log. If it doesn't, they can use the SCT to prove that the log misbehaved. In this way, auditors, monitors and clients cooperate to verify the correct operation of logs, which in turn provides clients with confidence in the [certificate,attestation] pairs they use to secure their communications. 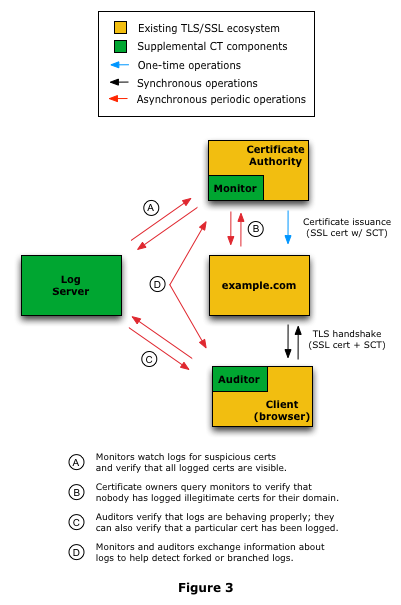 Figure 3 of How Certificate Transparency Works shows how the team believes it would normally be configured. As you can see, the monitor is actually part of the CA, checking at intervals that the log contains only the certificates the CA sent it. The auditor is part of the client, checking at intervals that the certificates in the SCTs it receives from Web servers are correctly stored in the log. TLS servers should send SCTs from multiple logs in case one or more logs are not acceptable to the client (for example, if a log has been struck off for misbehavior or has had a key compromise). Each log gets its content directly from the CAs, not via replication from other logs. Each log contains a subset of the total information content of the system. There is no consensus mechanism operating between the logs, so it cannot be abused by, for example, a 51% attack. Monitoring and auditing is asynchronous to Web content delivery, so denial of service against the monitors and auditors cannot prevent clients obtaining service. Sustained over long periods it would gradually decrease clients' confidence in the Web sites' certificates. Looking at the list of logs Chrome currently trusts, it is clear that almost all are operated by CAs themselves. Assuming that each monitor at each CA is monitoring some of the other logs as well as the one it operates, this does not represent a threat, because misbehavior by that CA would be detected by other CAs. A CA's monitor that was tempted to cover up misbehavior by a different CA's log it was monitoring would risk being "named and shamed" by some other CA monitoring the same log, just as the misbehaving CA would be "named and shamed". the market for SSL certificates is highly concentrated, despite the large number of issuers. In fact, both data sets find that around 75 percent of SSL certificates in use on the public Web have been issued by just three companies: Symantec, GoDaddy, and Comodo. Let's Encrypt may have had some effect on these numbers, which are from 2014. All three major CAs have suffered reputational damage from recent security failures, although because they are "too big to fail" this hasn't impacted their business much. However, as whales in a large school of minnows it is in their interest to impose costs (for implementing CT) and penalties (for security lapses) on the minnows. Note that Google was sufficiently annoyed with Symantec's persistent lack of security that it set up its own CA. The threat that their business could be taken away by the tech oligopoly is real, and cooperating with Google may have been the least bad choice. Because these major corporations have an incentive to pay for the CT infrastructure, it is sustainable in a way that a market of separate businesses, or a permissionless blockchain supported by speculation in a cryptocurrency would not be. Fundamentally, if applications such as CT attempt to provide absolute security they are doomed to fail, and their failures will be abrupt and complete. It is more important to provide the highest level of security compatible with resilience, so that the inevitable failures are contained and manageable. This is one of the reasons why permissionless blockchains, subject to 51% attacks, and permissioned blockchains, with a single, central point of failure, are not suitable. The LOCKSS system preserves e-journals that have intrinsic value and contain information that powerful interests might want changed or suppressed. A bad guy subverts an SSL connection from a browser to a website by intercepting the connection and supplying a valid certificate that is different from the one that actually certifies the website. For example, it might be signed by the Dept. of Homeland Security instead of by Thawte. The browser trusts both. Thus the question is: "how to detect that the certificate is not the one it should be?" This is a similar question to the digital preservation question: "how to detect that the content is not what it should be?" On a second or subsequent visit the browser can compare the certificate with the one it saw earlier, but this doesn't help the first time and it isn't conclusive. There are valid reasons why a certificate can change, for example to replace one that has expired. Each box gets its content directly from the publisher, not via replication from other boxes. Each box contains a subset of the total information content of the system. Unlike CT, there is a consensus mechanism operating between the boxes. But, unlike blockchains, it is not designed to enforce lockstep agreement among the boxes. It allows a box to discover whether its content matches the consensus of a sample of the other boxes. This is similar to the way that CT's monitors and auditors examine subsets of the logs to detect misbehavior. Monitoring and auditing is performed by the boxes themselves, but is asynchronous to Web content delivery, so denial of service against the boxes cannot prevent clients obtaining service. Sustained over long periods it would gradually decrease clients' confidence in the preserved Web content. Our system, PERSPECTIVES, thwarts many of these attacks by using a collection of “notary” hosts that observes a server’s public key via multiple network vantage points (detecting localized attacks) and keeps a record of the server’s key over time (recognizing short-lived attacks). Clients can download these records on-demand and compare them against an unauthenticated key, detecting many common attacks. The final aspect of the notary design is data redundancy, a cross-validation mechanism that limits the power of a compromised or otherwise malicious notary server. To implement data redundancy each notary acts as a shadow server for several other notaries. As described below, a shadow server stores an immutable record of each observation made by another notary. Whenever a client receives a query reply from a notary, the client also checks with one or more of that notary’s shadow servers to make sure that the notary reply is consistent with the history stored by the shadow server. Just as in the LOCKSS system, if there are enough notaries and enough shadow servers the bad guy can't know which notaries the client will ask, and which shadow servers the client will ask to vote on the replies.